Spin this free slot, D.J. Wild by Elk Studios to the sounds of Swedish House Mafia and Avicii. The soundtrack is called Fantasize and can be found to put on your playlist from Spotify™ if this musical compilation becomes a favorite. Listen to the top DJs in Stockholm while playing in free demo play. Get D.J. Wild on iTunes as well. It’s a classic demo slot as far as slot symbols but does include 5 reels and 20 paylines. 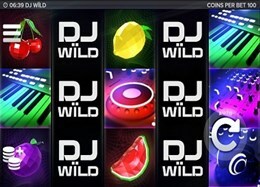 Respins, Sticky Wilds, Expanding Wilds and a Jackpot Wild symbol are the special features of the game which will expand 100% on your mobile device A DMX light controller syncs the turn of the reels with the music. There are 3 different betting strategies that player’s can set according to their preferences. This free slot can be played in fun mode and has the maximum quality of what mobile has to offer both visually and and auditory. The game can be played directly from the Elk Studios website, a new provider of exceptional demo slot games created mainly for mobile users. How to play D.J. Wild Slot for Real Money? D.J. Wild Slot can be played for real money just the same as it can be played simply for fun. Visiting and registering at an online casino is the place to start. Take advantage of casino first deposit bonuses and more. Rewards differ from online casino to online casino so pick wisely. Once you’ve located the game which generally can just be put in a search engine to find, playing D.J. Wild Slot for Real Money just takes you to make a decision on your betting amount and according to 1 of 3 levels. Once the spinning has begun and the music has begun to play, try to catch the D.J. Wild symbol on reels 1, 2, 4, and 5 and the symbol with expand either horizontally or vertically to cover 2 or 3 symbols. After payout a respin will begin with an expanding, sticky wild. Increase the previous spin win with this extra feature. The respins can continue to be retriggered with more D.J. wild symbols. The way to make the jackpot win is by spinning wilds on 1, 2, 4, and 5 reels then the jackpot wild is added to the middle reel where players will then receive the chance to trip D.J. Wild’s biggest win.